While focusing on a project I've been working on for the last five months or so, I figured that I would start a new thread on here for narrow gauge: (009, HOe, HOn30, HO 2 1/2, all the same thing) only this would consist of projects/layouts as well as further discussion of where Bachmann's narrow gauge range will potentially go from here, similar to the Large Scale Thomas thread posted by Large Scale Champion. Ever since this range started, the sales for Skarloey went above and beyond the roof, selling out in less than a month in Bachmann warehouses. It's pretty clear that this range will not be slowing down anytime soon and Rheneas will be no different with sales. I am sure the range will continue to grow from there with other characters in future years such as Sir Handel, Peter Sam, Rusty, and Duncan just to name a few. Now, I have something I would like to share with everyone, which is my 009 mining railroad that I have been doing over at my model railroad club. It is far from over as there is a lot more work that needs to be done. I hope you will enjoy the pictures that I am about to provide and that everyone will stick around for when I post updates. This is what the mountain started as at first, a rather... basic design that was hardly touched. The bottom you could see an HOn3 line that never even got finished or had track laid, whereas the top was a dual gauge (HO and HOn3) track that hasn't been used compared to our main HO lines. It was pretty lifeless, and visitors at our shows always kept asking why we have never used it. The original plan was to just stick with HOn3 at the bottom and dual gauge on top, like the original, while redoing the mountain. However last year, after convincing a few other members (due to Skarloey's announcement) we are doing a track in the middle of the mountain for 009 making it possible to run Skarloey and other 009 models in the club. We have already started work on the mine. Each of the different tunnels you see within the mine are empty mine shafts. These will contain some stationary track and wagons in each shaft, while locomotives can travel alongside the main track. There is a siding in the mine where we plan on leaving some mining cars with some decoration such as gold or jewelry. We may even create a scene involving mineworkers in there too. Out in the open you can see that there's a second section of track that we plan on adding in the future, this will be used for loading and unloading different loads during our club operation nights. This will be the other tunnel on the layout that the engines will be coming out of after traveling through the mine. We also get a nice view of the waterfall from here as a bonus. We also have a staging yard. This is where we will be setting our trains, prior to our shows as well as where we will start our clubs operations. The staging yard leads directly to the mine. As an added bonus for you guys, here are pictures from our Easter show. We decided to wire the tracks temporarily so we can run Skarloey in our show to show visitors and our loyal fans a sneak peek of what was to come. The responses were amazing, I was amazed when parents told me that they were familiar with the Skarloey characters and even mentioned that they read the RWS (they called them the "old stories") involving the Skarloey engines. Another kid even mentioned Duke of all characters when he was talking about narrow gauge, speaks for itself really. Even though I am still working on my own HO layout, this is a pretty good alternative for now for my own 009 set up as I am in charge of this specific project in my club. We still have a long way to go, but in the end we all know it will be worth it. Feel free to leave feedback, otherwise I would love to see other 009 projects/layouts that people have been planning on here. This will also be a place where we can talk about future products for the Skarloey range, so if anyone has ideas or suggestions for this they would like to share they are more than welcome to do so. I have been building a 009 layout since last summer in my home. The quarry side needs tending, but the "country station" side looks good, but is FAR from done. ORto pursue a Thomas character. I have considered time, effort, and money. Mightymac would prove expensive, as it would require two chassis. Freddie and Duke seem reasonable. I am on the fence about making another Thomas loco, but we'll see when summer arrives. For the last year or so, it's come to my attention that a number of Thomas fans don't know the difference between HOn3 and HOn30, the latter being what the Bachmann Skarloey is. Some fan sites/videos, including the Thomas Wikia have even labeled the Skarloey products as HOn3 which I can tell everyone right now that this is not true. This post will be used to inform fans the differences between these scales. Do not be fooled by the similar names of the two scales - these are completely different. That '0' at the end of "HOn30" does make a difference. The main difference is the width, with HOn30 to the left and HOn3 to the right. HOn3 track is slightly wider then that of HOn30. HOn30 trains run on 9mm wide tracks (more commonly known as N gauge). In real life, the rails are 30 inches apart from one another, or 2 1/2 feet (which goes with another name for this scale HO2 1/2). Skarloey and other models can run just fine on this track because it's the same scale. The same applies for 009 and HOe, since as mentioned earlier they all run on the same track. HOn3 trains on the other hand, run on 10.5mm wide tracks. Both rails are 3 feet apart from one another in real life. Therefore, the track is a slightly wider than what Skarloey or other HOn30 models can run on. As you can see, a Peco wagon (which is the exact same as the open wagon in the Skarloey line) can do just fine sitting on HOn30 track. But on HOn3 track, as shown here, it's going nowhere. HOn3 is more popular in the US and therefore you will find more US models in that scale than in HOn30, which is more popular in the UK. Bachmann does not currently make HOn3, but there are other manufactures that produce HOn3 models and stock such as Blackstone Models. I hope this helps anyone who was confused about this earlier. It's honestly a common misconception, and you wouldn't be the first person to get them mixed up. I used to think they were the same thing until I became more invested in 009 modeling. Finally, there will be more pictures and updates coming soon with the club layout. We haven't worked on that part of the mountain recently as we've been working more on dual gauge (which is the top layer). In the mean time, any thoughts/suggestions on the the setup I have now would be highly appreciated. Thomas Will Be Coming Down Our Track Forever!! I was confused for sure. What's the best place to buy track in your opinion Chaz? All I want is, Stepney, Boco, Daisy, Harvey. I ordered my Skarloey back in the beginning of March and I must have missed out on the first run of the model because I'm still waiting for the second round to come in. I also ordered track from Hattons back then too but now I have track and no engine! Haha but I found Skarloey for an amazing price on a through a model shop I don't normally use so there wa no way I was going to cancel my order! Anyway, in my humble opinion, Hattons has the best prices for track. I purchased Peco 009 track. It looks great for a more NG feel instead of using N gauge track. That's exactly what I'm looking for. That NG look. I'll probably do the same. Gotta love Hattons. Hattons is pretty good, if not Hattons there is a good deal at Wholesale Trains for a bundle of 25 if you are interested, and would rather order from the US with cheaper shipping charges. If you don't wish to mess with Flex Track from PECO, they officially offer set track in 9" radius (which Skarloey navigates), straights and points. Those layouts are looking fantastic! I'd love to build one, but I have materials for On30 myself; still fun all the same, narrow gauge, no matter what scale. Very happy with how its looking. I saw those on Twitter, those photos are beautiful. I love how the track isn't sitting on plain grey ballast, it looks used, and that really enhances the look. Great job! Do you plan on making Skarloey's wheels black as they ought to be? I don't think I'll paint his wheels. We have mostly been working on getting the design of the mountain in place, the top bridge is dual gauge and the bottom in the photo is 009. Most of this consisted of re-using some old mountain bits from an old setup and adding cardboard strips with plaster sheets. It's all coming together very nicely! Started working on the other side of the mountain for a little bit too. Oh boy! That should be great! 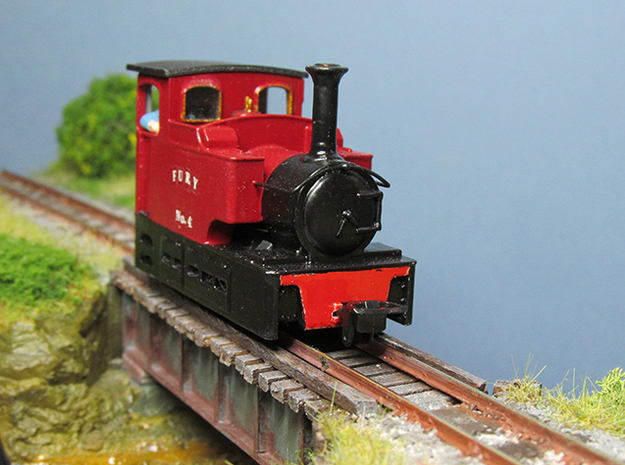 Duke has always been my favorite Narrow Gauge engine. What face did you use?